Pair a black floral sheath dress with a beige quilted leather clutch, if you want to dress for comfort without looking like a slob. To add oomph to your getup, finish off with grey satin heeled sandals. 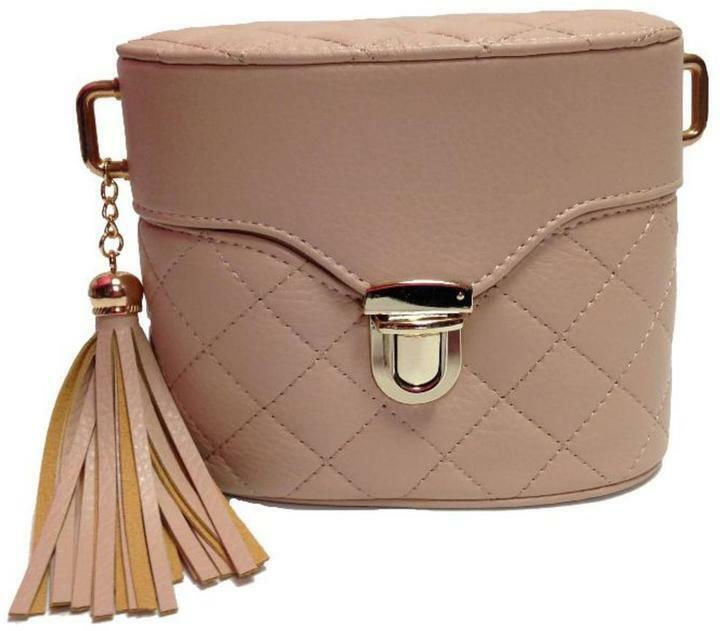 Consider wearing a pink blazer and a beige quilted clutch from shoptiques.com for an unexpectedly cool ensemble. You could perhaps get a little creative in the shoe department and dress up your ensemble with silver leather pumps. Try teaming a light blue fur jacket with a beige quilted clutch, if you feel like practicality dressing without looking like you don't care. If you're obsessed with functionality dressing when it comes to fashion, you'll love this chic pairing of a beige button down blouse and a beige quilted clutch. We're all seeking comfort when it comes to dressing up, and this combination of a silver shift dress and a beige quilted clutch is a practical example of that. To bring out the fun side of you, complement your getup with blue athletic shoes. If you're all about relaxed dressing when it comes to your personal style, you'll love this totally stylish combination of a mint biker jacket and a beige quilted clutch. Grey snake leather heeled sandals will instantly lift up even the laziest of looks.